Some call Japanese snacks "weird". That's not fair—the vast majority is rather pedestrian. There are some Japanese snacks that are, how should I say, peculiar? Many of them actually end up tasing great, first repelling you and then pulling you in with unique flavor sensations—or as I like to say, flavorsations. Chocolat de Tomato is not one of those snacks. It's downright awful. A month or so ago, I spotted Chocolat de Tomato in a supermarket and snapped a photo, putting it online. As a cultural snackologist, it is my job to document these unusual treats. An internet person told me that Chocolat de Tomato was the worst snack he had in Japan. I was intrigued. I'll be honest. I hate tomatoes. I love fruit and eat tons of it. I just detest tomatoes. It's not the acidity per se, but simply the texture of raw tomatoes. But I must be clear: I hate tomatoes. Any other fruits and vegetables are totally cool, but tomatoes are on my no fly list. Yes, I realize that this might discount my Chocolat de Tomato review entirely. However, I adore ketchup. Tomato soup and tomato sauce are totally cool. It's really a texture thing with raw tomatoes and me. So going into this, I had an open mind. 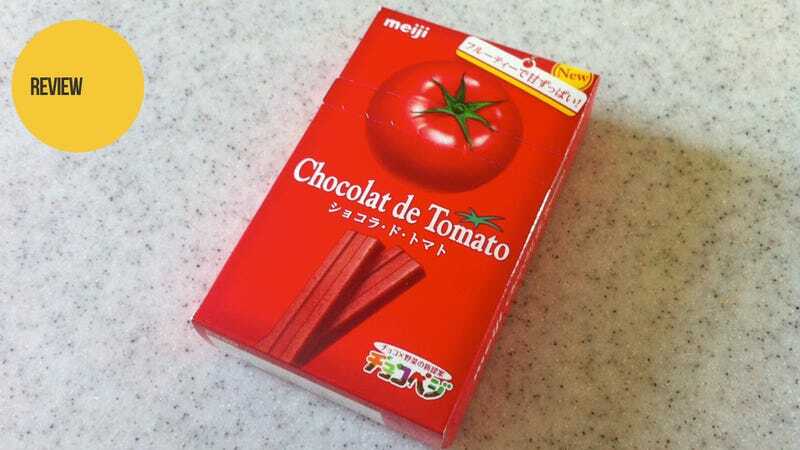 Surely, Chocolat de Tomato will be like ketchup or tomato sauce or any other processed tomatoes (which I like), but with chocolate (which I like). I went back to the small supermarket, but alas, the treat was nowhere to be found. Japanese people love new things, which is why the snack wizards are always churning out new drink flavors, new potato chip flavors, and new snacks. Here's the thing with many of Japan's peculiar flavors. They are not long lasting. They are shuffled in and out of stores before you know it. Sometimes, it actually seems like they were released as a dare—or as a gag. Chocolat de Tomato seems like one of those products—something that was released to see if people actually buy it. It wasn't until I was in Tokyo last week that I actually spotted Chocolat de Tomato in a tiny, old supermarket, collecting dust and unloved. I was elated. The box proclaims that this is snack is fruity and sweet-and-sour. Opening the box, I was greeted with several individually wrapped tomato chocolates. Meiji, like pretty much all Japanese snack companies, is huge on the Japanese culture of wrapping, so I wasn't surprised to see something double wrapped. The chocolate itself was red. That's to be expected. This is a tomato chocolate. The shape was stick-like, which didn't seem to be very tomato-y. It smelled like tomato soup, which, as I previously mention, I like. It also smelled like chocolate, which I also like. The combination of the two, that sweet sour scent, reminded me of throw up. Biting into it, the first flavor was sweet and sugary. Okay, I can dig this, I thought. Then the acid hit—a strong, acid flavor hit. It overpowered the sugary chocolate flavor. The acidity made for a dry finish, free of any sweetness. But once again, the combination of both had hints of barf. You know when people say that they've just thrown up a little in their mouths, that's what Chocolat de Tomato tasted like. That or like some jerk had put a Hershey's bar in my tomato soup, and then I threw up in my mouth. I could honestly only eat two pieces of Chocolat de Tomato. It's a horrible, horrible snack, and the worst treat I've had in the ten years plus I've lived here. The snack started making me sick, as did the mere act of looking at the box. The remaining pieces sit in the refrigerator, waiting unloved, forlorn, and for something to eat them on a dare. You game?